The Logging tab allows the user to select specific attributes to log for each object. On the Logging tab, the automatic measures available within E-Prime are listed and categorized (i.e., Dependent Measures, General, Time Audit, etc.). Click the checkbox next to each attribute to set the logging status. The following table defines the measures that may be automatically logged for an object collecting input. An entire category of measures may be selected through the Data Logging field on the Duration/Input tab. NOTE: The following table lists SlideChoice and SlideSlider properties as beginning with Choice1 and Slider1 respectively. This is the default value for a newly created Choice or Slider objects, and the name of the property will change depending on the name of the Choice or Slider object (e.g. ChoiceABC.ACC, ExperimentSlider.RTTime, etc.). ACC DependentMeasures Reflects the accuracy of the response logged by the input object. ACC is based on a comparison of the RESP and CRES Pproperties. CRESP DependentMeasures Returns the correct response associated with the input collected by the object. This property is generally set internally according to the value in the Correct field in the Response Options for an object, but may be set via script at run-time. RESP DependentMeasures Returns the last (i.e., for single response input) or entire response (i.e., for multiple response input) collected by the object. RT DependentMeasures Returns the reaction time of the last input collected by the input object, timed relative to the start of the input. RTTime DependentMeasures Returns the reaction time of the input relative to the start time for the experiment. Tag General Defines a string value to be logged with the object. This is a generic property to allow the user to associate some data with the object. Choice1.ACC SlideChoice Subject's response accuracy to SlideChoice Sub-Object (0 or 1). Choice1.ChangeCount SlideChoice Count of response changes. Choice1.RT SlideChoice Subject response time (ms) to SlideChoice Sub-Object. Choice1.RTTime SlideChoice Subject response timestamp to SlideChoice Sub-Object in relation to beginning program execution. Choice1.ResponseCount SlideChoice Count of responses. Choice1.Value SlideChoice Value of SlideChoice selected. Choice1.ValueDataTag SlideChoice Data tag of value. Choice1.ValueLabel SlideChoice Label of value. Choice1.ValueOrdinal SlideChoice 1-based integer value of item position. Slider1.ACC SlideSlider Subject's response accuracy to SlideSlider Sub-Object (0 or 1). Slider1.ChangeCount SlideSlider Count of response changes. Slider1.RT SlideSlider Subject response time (ms) to SlideSlider Sub-Object. Slider1.RTTime SlideSlider Subject response timestamp to SlideSlider Sub-Object in relation to beginning program execution. Slider1.ResponseCount SlideSlider Count of responses. Slider1.Value SlideSlider Value of SlideSlider selected. 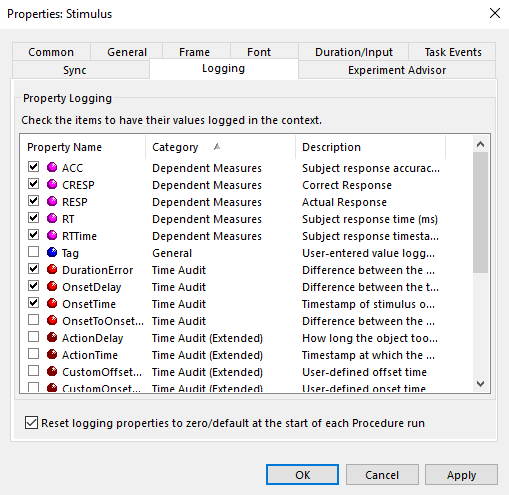 DurationError TimeAudit Difference between the Duration property setting and the actual duration. OnsetDelay TimeAudit Difference between the TargetOnsetTime and the actual OnsetTime. OnsetTime TimeAudit Timestamp at which the object begins its critical action (e.g., drawing to the screen). OnsetToOnsetTime TimeAudit Difference between the next and this onset time. ActionDelay Time Audit (Extended) Amount of time necessary for the object to perform its critical action (e.g., drawing to the screen). ActionTime Time Audit (Extended) Timestamp at which the object finished performing its critical action (e.g., drawing to the screen). CustomOffsetTime Time Audit (Extended) Sets the target offset time when custom timing is in use. CustomOnsetTime Time Audit (Extended) Sets the target onset time when custom timing is in use. Duration Time Audit (Extended) Determines the intended duration of the object in milliseconds. FinishTime Time Audit (Extended) Timestamp at which an object has finished the execution of its Run method. OffsetDelay Time Audit (Extended) The difference between the TargetOffsetTime and the actual OffsetTime. OffsetTime Time Audit (Extended) Timestamp at which the object’s offset action (i.e., clean- up)began executing. PendingInputMasks Time Audit (Extended) Logs if any input masks are still collecting input at the end of a procedure. PreRelease Time Audit (Extended) Time released during the duration of the current object (after the object finishes its critical action) to allow for setup of the next object. StartTime Time Audit (Extended) Timestamp at which execution for the object began (i.e., time at which the Run method began to execute). TargetOffsetTime Time Audit (Extended) Calculated timestamp used by an object as the target time for offset (i.e., begin clean up action). TargetOnsetTime Time Audit (Extended) Calculated timestamp used by an object as the target time to begin performing its critical action (e.g., drawing to the screen). TimingMode Time Audit (Extended) Sets the timing method to be used by the object. Cumulative timing is used to absorb the processing time between events, and to maintain a certain interval duration between events or between trials.